Before deciding to build an addition to our existing home, we considered purchasing another home and moving instead. On our “must have” list was a sizable and updated master bathroom. Yes, master bathrooms definitely increase the marketability of homes. I believe it is also one of the better investments to make when remodeling. After looking at a few dozen homes for sale, we decided to get exactly what we wanted so we stayed put and built a large addition. An addition with a great master bathroom, of course. Door uses soft operating European hinges. Multi layer 12 step hand glaze Baked on finish to prevent pealing, cracking, fading. NOTE: We purchased the vanities and linen cabinets from MaxFurniture.com. At the time of purchase, they had the best price on James Martin furniture and they had a Valentine Day special that included $200 off the purchase of $2,000 or more. It was a great deal given the vanity included the sink and the glass top and the linen cabinet was on sale for less than any other site we found that carried James Martin furniture (several websites have it FYI). James Martin Signature collection is a private label of handpicked pieces made in small quantities to ensure highest possible quality. Premium grade woods, multi layer hand glaze finish, carefully hand made one by one by highly skilled craftsmen are a cornerstone on this special collection. There are a lot of factors going into making top quality furniture. Here at Max Furniture we follow all the latest technological advances to make sure we give you the highest quality product at a best possible price. Please read below what makes our furniture one of the best in the industry today. Bathroom vanities are one of the most challenging pieces of furniture produced today. Elevated humidity levels, and heavy use, command use of very best materials and most advanced finishing techniques available today. Wood: All of our vanities use Kiln-dried selected hardwoods. All wood is properly dried to prevent warping and cracking. Inner construction: All of our wooden vanities use framed type construction. This ensures stability and unsurpassed durability for many years to come. We do not produce knock down or flat pack type of cabinets that are joined with bolts and staples. Finish: All of our vanities have properly sealed finish to prevent pealing and fading in elevated humidity levels. My brother found the ceiling fan at a garage sale or estate sale and gave it to us. 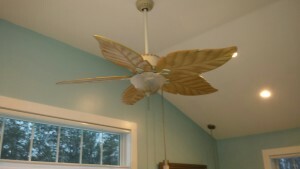 Similar fans are the Hampton Bay Costa Mesa Ceiling Fans sold at Amazon.